Johnson, living in or near Richmond, determined to learn how to read and write, and succeeded in so doing. He also memorized a map of the United States. Converting to Christianity as a young man, he freed his soul. He desired to join a Baptist church, the preferred denomination of many Christian slaves, but prior to the war was prevented from doing so. Of Richmond’s black churches, Johnson noted: they had white pastors, who never failed to keep us informed about Abraham’s servants, and “servants obey your masters,” and what the Angel said to Hagar–Gen. xvi. 8, 9. When the war commenced, Johnson served for a time as a cook for his young master, before being sent back home. In 1863 he married a fellow slave who was the maid of a sister of Confederate General Robert E. Lee. Quietly, he taught other slaves to read. All anxiously waited for their freedom, which they believed was imminent. For years the poor slaves had cried to God for help; when His time came their prayers were answered. “How did the Freedmen manage to get on after the war?” is a question very often asked. Just at this time many of our friends were perplexed to know what to do with us. Thousands were homeless, and, having been deprived of intellectual light and spiritual instruction, they were ignorant. But in the Northern States there were thousands of true-hearted Christians who, at the commencement of the war, had given their sons and millions of money; and, true to freedom and the oppressed, these good people came to the front with their money, their time, and influence. Every branch of the Christian Church commenced to help the poor freedmen. The Government established the Freedman’s Bureau. General O. O. Howard was appointed superintendent. It furnished bread for the destitute, and found homes for the homeless, and established schools to instruct the ignorant. As doors were opened, they went to work–thousands of them for their former masters, thousands for themselves; many went into the Northern and Western States. Notwithstanding the prejudice which has existed against them, and, to some extent, continues to exist to-day, they have made a progress without a parallel in the history of any race in similar circumstances. We find them to-day in every branch of industry–farmers, mechanics, engineers, tradesmen, merchants, teachers, professors, doctors, lawyers; and many are occupying high positions in every part of the Government–legislators, Members of Congress, mail agents, clerks, &c. But, above all, many who were once slaves have passed through the colleges, and are now able ministers of the Gospel. I left New York in September, 1866, for Chicago, Illinois. Here I made up my mind to study hard, and try to consecrate myself more to the Master’s work. I united with Olivet Baptist Church (coloured), composed of nearly all freedmen, and commenced to do what I could. I went to work for Mr. H. M. Kinsley, a first-class caterer, in Chicago, who became a friend to me, and I thank God is one among those FRIENDS whom God has raised up for me, who continues to be a friend. When I left him to do mission work, he said, “Thomas, you shall never suffer.” I also found a friend in Mr. Pullman, of the “Pullman Palace Car Company,” and for a while I worked for the company. The great kindness of Mr. and Mrs. E. S. Isham will always be remembered with gratitude. All this time I was studying all I could. My principal studies were in my Bible. Soon I began to do a little mission work. In the spring of 1869, I was sent out to Denver City, Colorado Territory, to take charge of a little church of freedmen, and to do mission work. They were not able to give me more than £57 a year. Hence my wife and I would work to make up a balance of our support. During the three years I was in Denver the good Lord wonderfully blessed me. All this time the desire to go to Africa to preach the Gospel to my own long-benighted people continued to grow upon me. Many of my friends became deeply interested about Africa, from hearing me speak so much of the country and its people–for Africa was in my talk, in my prayers, and in my addresses. After spending three years in Denver, I left to go to Africa. When I returned to Chicago, my friends persuaded me not to go, but to remain in the State. Soon I had a call from two churches. I made the matter a subject of prayer; after which I went to Springfield to supply for a while. In 1873, I was called to the Providence Baptist Church, Chicago, Illinois. Soon, Rev. 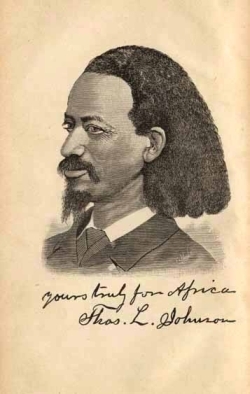 Johnson followed God’s call to Africa, where he ministered for over a decade, becoming a prominent African American missionary on the African continent, particularly in Liberia. When ill health led him to return home to America, he became a leading advocate for black missions in Africa.